I just wouldn't be me if I didn't somehow squeeze in a little comment on the magical duo that is Nick and Knight. If you've been following my blog for a while, you'll know that Nick Carter of the Backstreet Boys was pretty much THE teen idol of my life, the one I spent all of my teen years fawning over. And you'll also know that I serendipitously, completely independent of the collaboration that was NKOTBSB, also developed an interest (or, you know, a crush) on New Kids On The Block's Jordan Knight in 2011. So for my two favorite members of each of those groups to band together to record an album is ... I don't know. Beyond my wildest teenage dreams. Unicorns and rainbows and cotton candy and glitter and cupcakes and TACOS for life. Sprinkle Harry Styles in there and I don't even know what I'd do with myself. I'd probably be paralyzed. Musically, I didn't have the highest of expectations for Nick and Knight. The love affair with Nick Carter's been over for quite a while now and I just didn't think his voice would mesh well with Jordan's. 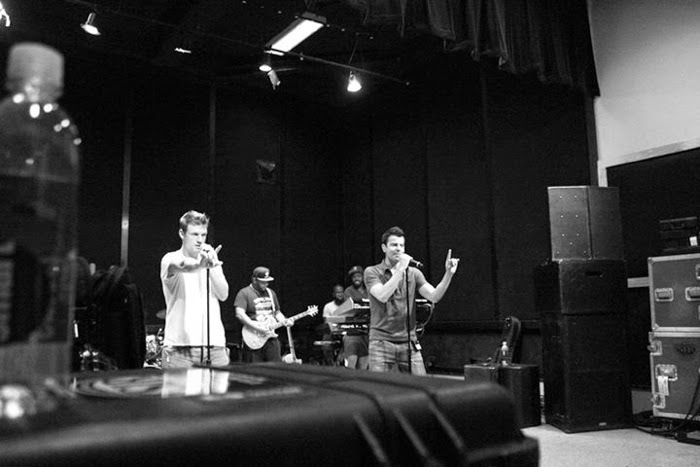 But when I heard the sneak peek of "Just The Two Of Us" and its funky soul-pop qualities, I wanted to hear more. And now the album's out. While I still have my reservations about the pairing -- Jordan's voice trumps Nick's in all categories except maybe enthusiasm -- there are a few songs I've been enjoying.